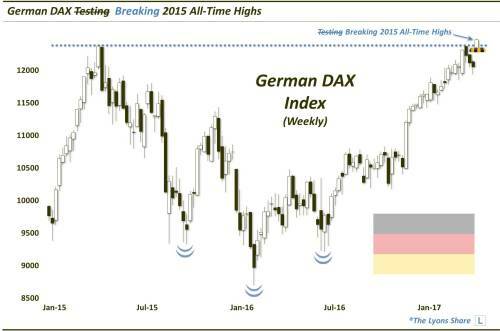 Just 3 weeks ago, we noted the milestone, and challenge, facing Germany’s DAX stock index. A furious 4-month, 20% rally had brought the index precisely to the level of its 2015 all-time highs just south of 12.400. How would the index react? As we noted in that prior post, “a reasonable reaction would be for the DAX to pause or consolidate its recent gains for some time prior to attempting a breakout to new highs.” This “speed bump” scenario is exactly what has unfolded in the DAX, at least for a few weeks. The index pulled back some 3.5% over the subsequent 2 weeks before finding some support at the 23.6% Fibonacci Retracement of its post-December blast, as well as its 50-day simple moving average. This past Monday, following an apparently benign outcome to the highly anticipated elections in France, the DAX shot up more than 3% off of that support. In the process, it hurdled the speed bump that was its former all-time high – in Dukes Of Hazzard fashion. So is it past the speed bump and on to the Autobahn for German stocks? In theory, it should be, at least in the intermediate-term. In the immediate-term, the new high was not decisive enough to say definitively that the former all-time highs were taken out. Therefore, we could still see some more brief backing and filling before the DAX takes off. Like much of Europe, though, a new up-leg in the DAX does appear to be a good bet. The iShares MSCI Germany Index Fund ETF (NYSE:EWG) was unchanged in premarket trading Friday. Year-to-date, EWG has gained 12.05%, versus a 6.74% rise in the benchmark S&P 500 index during the same period.